Earth from Space: Fogo, Cabo Verde. The Copernicus Sentinel-2A satellite takes us over Fogo, Cabo Verde. This small volcanic island, which can be seen in the right of the image, is about 25 km in diameter and home to around 35 000 people. The combined population of the nine inhabited islands that make up the Republic of Cabo Verde is estimated to be 550 000. These islands lie in the Atlantic Ocean, around 600 km off the west coast of Africa. 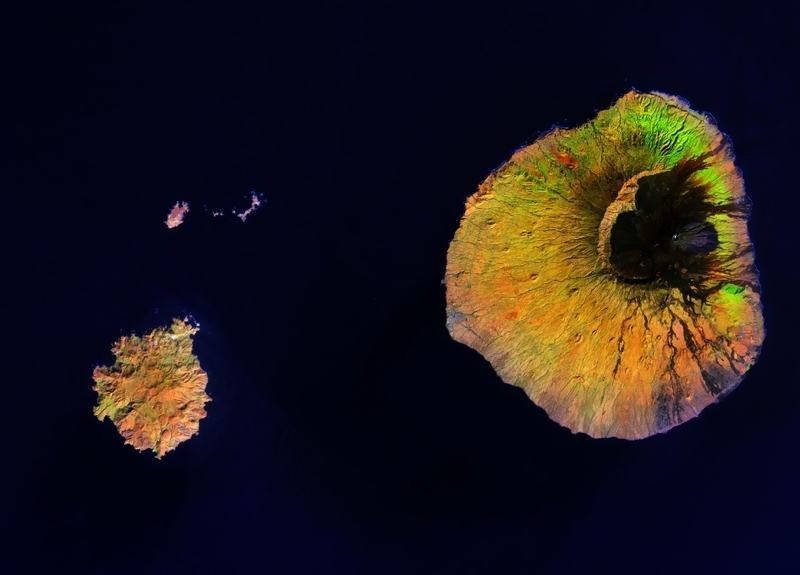 The black area in the island's centre is the crater of the Pico do Fogo - Fogo's highest point stands at 2800 m, and is also the highest peak in the entire Republic of Cabo Verde. It last erupted in November 2014 to February 2015, totalling 77 days of activity. In some places to 75% of the buildings were destroyed, mostly by lava. In the northeast of the island, vibrant green highlights a vegetated area, where coffee is grown. There is a long tradition of coffee growing here, although the semi-arid climate and reduced rainfall in recent years make this a challenge. Other crops grown on the island include peanuts, oranges, tobacco, and beans. More arid and rocky areas are shown in a mix of yellow and orange. In the bottom left of the image we can see the island of Brava, with three islets above: Rombos-Grande, Luís Carneiro, and Cima. The Sentinel-2 mission for Europe's Copernicus programme monitors our changing lands. This image, which was captured on 22 January 2018, is also featured on the Earth from Space video programme.